The “Big Boy” statue at Frisch’s restaurant in Washington C.H. was taken down by a fleeing stolen vehicle Sunday night. The driver, identified as Brandon Lee Williams, was apprehended by police near Washington Court Apartments. A Washington C.H. 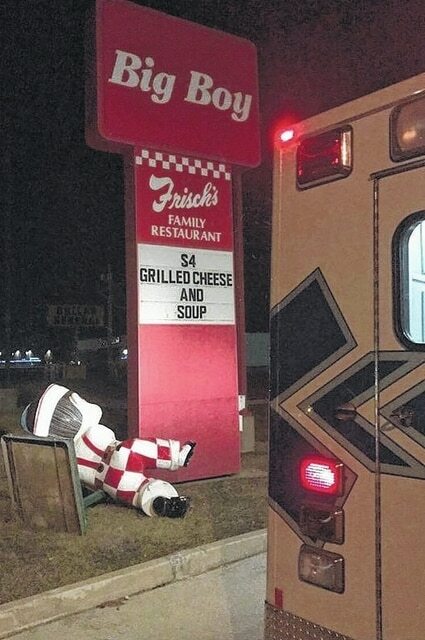 man is facing multiple felony charges following a chaotic Sunday night pursuit during which he reportedly struck police patrol cruisers, nearly struck two officers, ran over a cable box and took down the Frisch’s “Big Boy” statue with his stolen vehicle. At around 9:50 p.m. Sunday, Washington C.H. police officers received information that a stolen green Chevrolet Cavalier was at the Mobil gas station, 1104 Columbus Ave., according to reports. The vehicle was seen at the west side of the business in a parking spot. The driver, identified as Brandon Lee Williams, 31, of 9 Dunbar Court, reportedly attempted to drive his vehicle forward, nearly running over an officer, according to reports. Another officer then broke the passenger side window as the vehicle went into reverse and crashed into the front end of the police cruiser. The vehicle then went forward again and struck the side of the business. “I positioned my cruiser directly beside the passenger door, at which time the vehicle proceeded backwards and turning with its rear end towards E. Temple St.,” an officer wrote in his report. The front end of the stolen vehicle almost struck another officer as it was turning and then struck the front driver’s side of the cruiser, reports said. The vehicle continued backing up and struck the front end of the other cruiser. Once Williams straightened the stolen vehicle, he drove forward and around the back of the gas station and through the Fayette Pharmacy/Hong Kong Buffet lot with officers in pursuit. The vehicle then turned northbound onto Columbus Avenue at a high rate of speed with no headlights activated. As the vehicle passed the intersection of Glenn Avenue, Patrolman Jeffery Heinz positioned his cruiser toward the rear driver’s side and used the “PIT maneuver” on the stolen vehicle. The PIT maneuver, or precision immobilization technique, is a pursuit tactic by which a pursuing car can force a fleeing car to abruptly turn sideways, causing the driver to lose control and stop. The maneuver forced the stolen vehicle off the right side of the roadway. It traveled backwards into the grass along the Frisch’s Restaurant parking lot, ran over a Time Warner Cable box and struck the “Big Boy” statue before finally coming to rest against a light pole, police said. Williams allegedly fled on foot toward Washington Court Apartments, but was chased down and apprehended by officers. The passenger stayed inside the vehicle and was later released after providing a statement to police. Williams is being held in the Fayette County Jail on a $117,500 bond. He has been charged with two counts of first-degree felonious assault for attempting to strike officers with a vehicle, third-degree felony fleeing and eluding, fourth-degree felony receiving stolen property, fifth-degree felony vandalism, a parole violation and a probation violation.